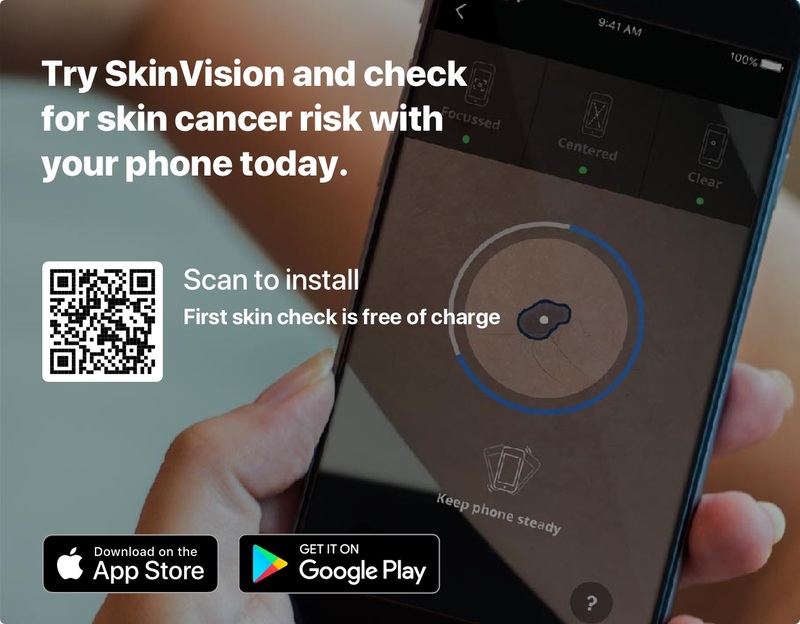 The majority of skin lesions are benign, but when a new lesion or mark appears on our skin, it can be difficult to tell whether it is dangerous. If you have any suspicions about a mark, mole or lesion, you should ask your doctor to check it. Nevertheless, it is useful to know how the common skin lesions look like to be able to recognise them. 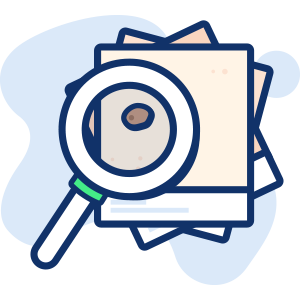 In this post, we explain all about the most common skin lesions (with photos) and their main characteristics. Seborrheic Keratosis, sometimes called senile wart, is a non-cancerous condition that occurs as a light brown, black or tan growth on the surface of the skin. These are usually harmless but may sometimes get irritated or be aesthetically unappealing. They can be removed, if necessary. 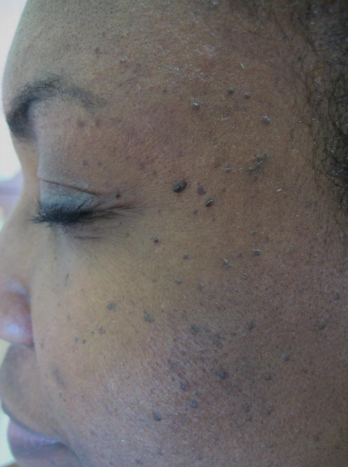 Dermatosis paulosa nigra is a condition that occurs mainly in darker skin types and usually starts to form in adolescence. 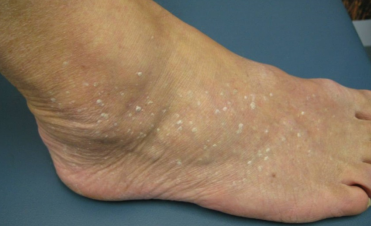 The lesions are small, darkly pigmented papules that are harmless and generally don’t require treatment. Skin tags or acrochordons are soft skin growths where a narrow papule sticks out of the skin from a short piece of flesh like a tag. Cherry angiomas are red papules filled with blood vessels made up of capillaries at the surface of the skin. 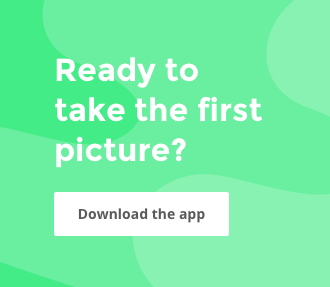 · They usually develop after the age of 40 and increase in number over time. · They occur in higher concentrations on the trunk of the body. 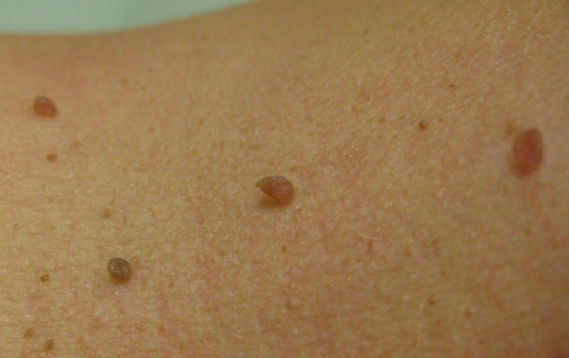 · They may resemble melanoma when they bleed or clot. · They do not require treatment, unless for cosmetic reasons. Dermatofibroma is a benign skin tumor that appears as a firm, round, brownish to red-purple growth usually found on the legs. · When squeezed, it dimples since the lesion is tethered to lower layers of the epidermis. Solar lentigos, also known as “sun spots” or “age spots,” are marks on the skin from sun damage that are not cancerous. Although no treatment is required, patients are often at an increased risk for skin cancer and need to exercise precaution. Sebaceous hyperplasia is a skin condition that occurs when sebaceous gland on the skin is enlarged. 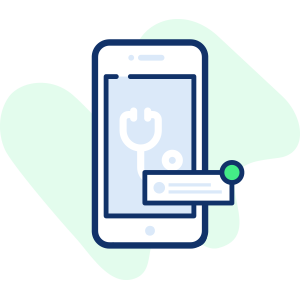 An epidermal inclusion cyst is a common skin cyst, sometimes called sebaceous cyst, even though it arises from hair follicles, not oil glands. The cyst contains a foul-smelling, cheese-like substance formed from degenerating keratinocytes. They can become red and aggravated if the substance enters the dermis, an occurrence which is often mistaken for an infection. 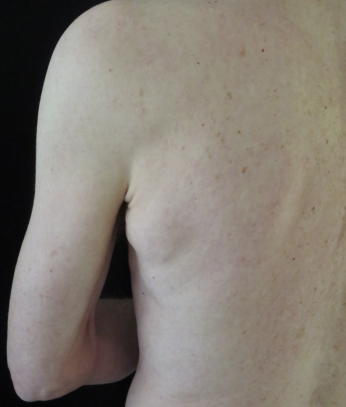 Asymptomatic cysts don’t require treatment. Excision can be used to remove a cyst if desired. Milia or tiny epidermoid cysts is a condition where small 1-2 mm white to yellow papules occur underneath the surface of the skin. 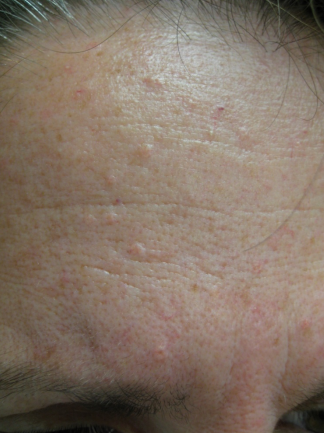 · They often occur on the cheeks, eyelids, forehead, and genitalia. Lipomas are collections of fat under the skin. 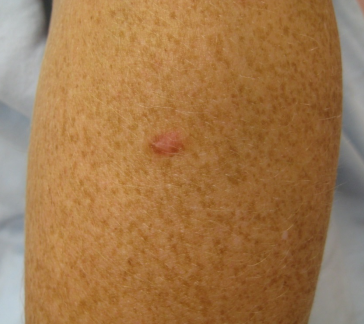 These common skin lesions are soft and mobile benign tumors that usually stop growing when they reach a few centimeters in diameter. Treatment is surgical and considered elective. What’s my skin type? Determine your skin type and how to care for it.